Kolkata was the British capital of India and this is the memorial they built for Queen Victoria. There are many other British memorials and government buildings around Kolkata but it is amazing how the modern city has swallowed them up. Because Delhi is now the capital, it seems that the old government buildings and memorials are a bit more isolated there than in Kolkata. When I first set up my tripod and started composing the first batch of photos, I placed my tripod on the concrete bank of a reflecting pool. I was careful not to break any rules, and we didn't see any signs warning us against it. But after about three minutes a couple of guards started hollering at me from the other side of the reflection pool, making quite a scene. There were thousands of people on the grounds and many were already staring at me. Now everyone was looking as Nini and I made our way to the guards. They simply said "no stands," and walked off. "No stands?" I thought, "no way." I've seen the photos of this place on 500px.com and trust me, tripods were used. So before walking away and giving up on Vicotria Memorial, I asked Nini to ask the guard a few more questions, and to ask if we can speak to someone in charge so we can get permission to use the tripod. Well we were lucky that our particular guard went for a rest on a bench, where there was another man in a suit (no tie). This man spoke English well and was keen to speak with me in English. He asked typical questions: Where are you from? 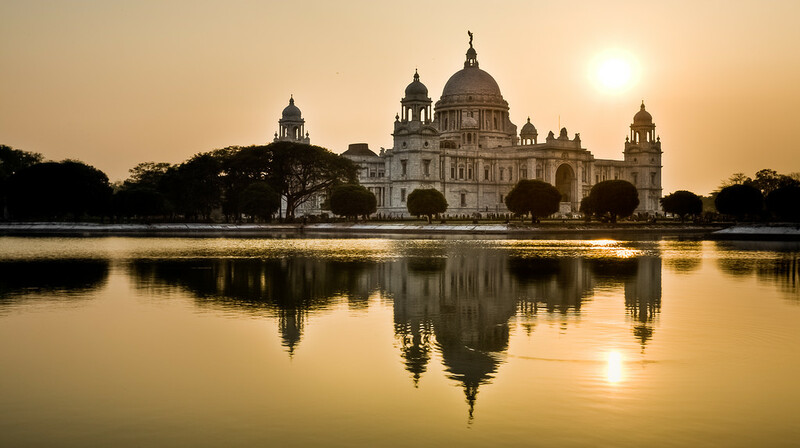 How do you like India... Kolkata... Victoria Memorial... etc.? After a bit of small talk he asked Nini what the problem was in Bengali. Then he started talking to the guard in English, telling him, "let this man do what he wants to do. He's come all the way from America to take photos of this place and now you're hassling him. Just let him use the stand." The guard nodded that it would be okay and told Nini in Bengali to try and be discreet about it and do it somewhere where he can't see us. Then the guy in the suit started talking again. He said: "This is India, it's 50/50 whether you'll be allowed to do what you want. This guard is nice, he's honest, and he doesn't take any bribes. So go and take your photos." Armed with the protection that a guy in a suit on a bench over there said we could, we set off to take some more photos before the sun went down. On the way out we checked with the security desk to see what time the gates open in the morning, and to our surprise he said just before sunrise, even though the sign said 10AM. We asked him about the rule on tripods and he said there is no rule, you're allowed to use them. So we had two people saying yes, and only one saying no, we were in the clear I thought. We arrive before sunrise the next day and there are about 50 people there to do their morning walks, exercises and meditations. It was very nice to see and everyone that was there was very friendly with us. Except the guard on the way in wanted us to leave the tripod with him, as tripods are not allowed. We explained that we had been given permission by the guy in the suit yesterday and another security guard told us there is no rule against tripods. But this guard wouldn't budge. Eventually we just walked past him with the tripod and told him we wouldn't use it. Ten minutes later I was using the tripod on the banks of the reflection pool again, this time with Nini standing right next to my camera so as to block it from the view of any of the guards in the middle of the complex (where most of them were). We didn't have any problems. So in the end, two officials said yes and two said no, a perfect 50/50. The man in the suit was right, this is India! This is a five exposure HDR. Thanks for all of the comments on my beach photos over the past week. I think I've got that out of my system for now at least. I will definitely go back to the Andaman Islands and spend a week or two. Judging from the photos I found on the web before going, I thought the Andamans would be super touristy and crowded, like Miami Beach or something. But I was so wrong, most of the beaches had just a handful of people on them, and we were on the most popular Islands. In fact, there are hundreds of islands in the Andamans that are not even inhabited at all, and many that see very few tourists. I can't wait to explore the islands in more thoroughly next time.